First off, tip of the hat to public television (and radio) who consistently provide quality non-commercial programming. 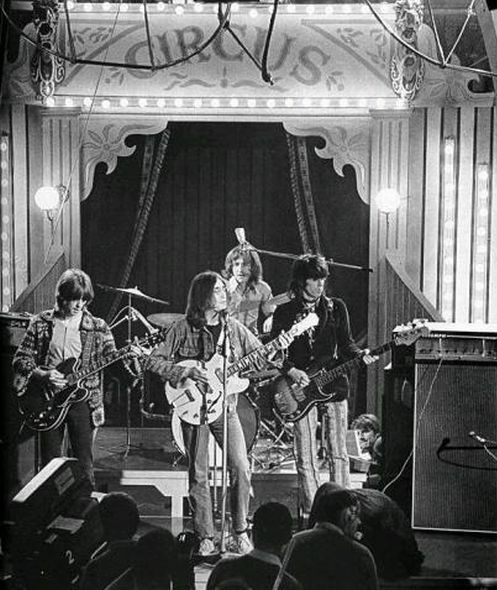 I make a point to support these, and the most recent reminder of why was randomly catching The Rolling Stones 1968 Rock And Roll Circus on L.A.’s PBS affiliate the other night. I had not seen this in some time and it was a great to revisit in it’s entirety, with minimal interrruption. The Back Story: In 1968, soon after the recording of Beggars Banquet, The Stones decided throw a happening with a bunch of their closest friends (read: artists, groupies, hanger ons) and film it to later be broad casted on television afterwards. What ensued looks like a full on party/concert featuring the likes of The Who, Jethro Tull, The Dirty Mac (John Lennon, Eric Clapton, Mitch Mitchell and Keith Richards performing The Beatles “Yer Blues”), Taj Mahal and last, but not least, Mick’s self-described (at the time girlfriend) “big titted angel,” Marianne Faithful. tivo’d this from LA’s pbs a bit ago and was completely blown away by the dirty mac portion. talk about a supergroup!! thanks for the mp3s! tony iommi was in jethro tull when they filmed this, too.